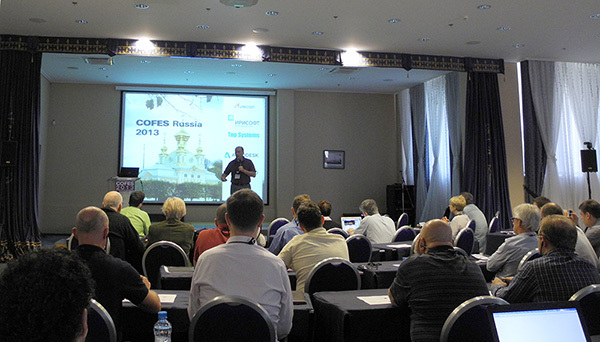 A new software product - RGK (Russian Geometric Kernel) was presented at the international multi-vendor conference COFES Russia 2013, which took place on 30th May - 1st June in Peterhof, near St Petersburg. This product was developed in 2011-2013 under the supervision of “Stankin” Moscow State Technical University within the framework of the project for “Developing Licensed Home 3D-Kernel”, funded by the Ministry of Industry and Trade of the Russian Federation. 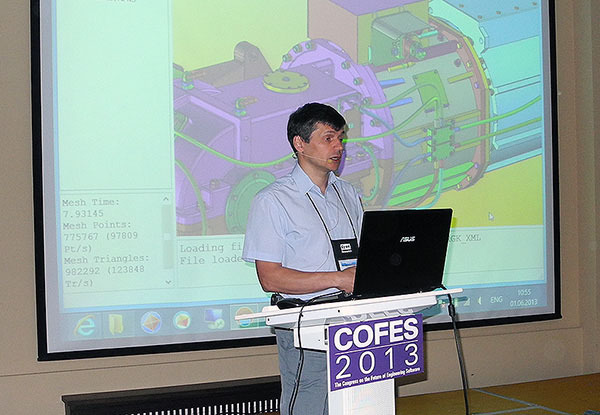 COFES, organized annually by Cyon Research Corporation think-tank since 1999, is a unique, globally-recognized platform for discussing engineering software technologies and trends. Since the main COFES participants are the leading vendors of engineering software, representatives of analytical and consulting firms, and CAD end-users, one could hardly imagine a better audience for the first general demonstration of RGK. 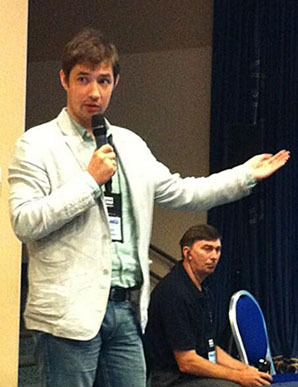 During the entire conference period, there were many participants who displayed a keen interest in the new Russian product, which led to numerous meetings and discussions of the results and prospects of RGK project, particularly, with the world’s and Russia’s leading specialists in geometric modeling. At one of the working meetings, Nikolay Snytnikov (LEDAS) and Sergey Kozlov (Top Systems) are discussing technological and organizational issues of developing geometric kernel with Ken Versprille, the inventor of NURBS splines – the cornerstone of modern geometric modeling. The main event specially focused on RGK 3D-kernel was a Round Table that lasted 1.5 hours. 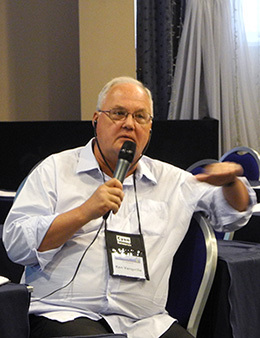 It was moderated by Evan Yares, an internationally recognized CAD-expert with 30-year work experience, who authored numerous publications on geometric modeling and 3D-kernels, and wrote many reviews, including the one of "Russian CADs". Representatives of Dassault Systemes Spatial Corp., Graebert GmbH, Bricsys, ASCON, Nanosoft, Top Systems, LEDAS, etc., took part in the discussion. Many of these companies not only develop applied CAD but also provide popular CAD tools, particularly CGM, ACIS, С3D commercial geometric kernels. The detailed consideration of RGK at the Round Table started with a presentation by Sergey Kozlov, CTO of "Top Systems", the company, which is project co-executor. Sergey Kozlov gave a 30-minute engineering presentation, where he talked about geometric kernel functionality, the goals, chosen methods, the results of the projects and the prospects for their use. He also demonstrated the work of the kernel using several complex scenarios. Detailed information can be found in a recently published paper «Russian 3D-kernel RGK: Functionality, Advantages, and Integration». In the course of an active follow-up discussion, participants emphasized the timeliness of the project, the ambitiousness of the tasks at hand, as well as highly efficient, top-quality work of the project executors. They highlighted the tight deadline for project execution, numerous science-intensive tasks that required coherent solutions, and the need to organize efficient distributed development by several groups of executors from various Russian cities. According to Nikolay Snytnikov, COO of LEDAS and the head of a developers’ team responsible for implementing NURBS library and the algorithms for constructing surface-surface intersections, the success of the project was not least at all determined by a factor that the involved companies already had considerable experience in geometric modeling, in total reaching several hundreds man-years. In the course of the Round Table an issue was raised about a possible role of RGK in development of Russian machine-tool industry, the output of which nowadays is below the level reached in the Soviet period. It was reported that one of the leading groups of RGK developers had an in-depth knowledge of the demand and specifics of engineering tools CAD-wise, and this knowledge enabled the new kernel to comprise all CAD-capabilities required for engineering tools. Experts praised highly the geometric kernel and its innovative aspects, including multithreaded computations, thread safety, use of GPU graphical devices for general-purpose computations, modern approaches to control and interaction between kernel objects. Experts on development of CAD and geometric kernels positively noted choosing XML standard as the main format for presenting kernel data and organizing daily automated testing with thousands of industrial users’ scenarios. 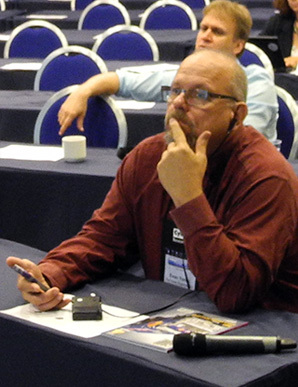 Ken Versprille also emphasized special importance of the system of regular automated testing for successful lifecycle of complex industrial software product, and spoke in praise of implementing these technological processes within the RGK system. In spite of a noticeable development of supporting technologies and changes in the requirements on the part of applications, in the past 15-20 years there were no new geometric modeling kernels on the world market. That is why most of the experts in the field were awaiting the new kernel with a considerable interest and hope. This interest was fully demonstrated throughout all discussions, particularly, at the Round Table. Competencies and vast experience of many participants were manifested not only in analyzing technological aspects of RGK, but also in examining possible kernel licensing schemes and the prospects of its implementation accordingly. It was emphasized that the issue of employing the outcome of the state investments – who will be an effective product owner, and how maintenance and support will be provided? – is a burning question not only for Russia but also for other countries. Efficiency of industrial use of the project results as well as in general the fate of this largely unique domestic product, with a great potential for broad use not only in Russia but on the world market, truly depend on finding a correct and timely solution to these problems.